Perfect for sheet and strip handling, as well as handling awkward materials. Foot pump delivers a service range of 31" lowered to 48.5" raised. 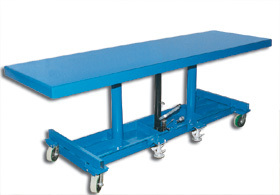 Structural steel base helps to distribute the load evenly. Royal Blue in color. FOB Shipping Point. Product No. Platform W x L Cap. (lbs.) Wt. (lbs.) Price Ea.